I don't know how many times I've heard the claim that "religion is just a crutch for the weak-minded". Many of the popular atheists in print today like to try and say that belief in God is the opposite of being rational.1 Others I've had conversations with dismiss faith as being the opposite of knowledge. I remember having lunch one day with some mutual friends. The discussion turned to matters of belief and one girl immediately said that we couldn't really know truth at all, to which I objected, saying that there are a lot of things we can know. We know 2 + 2 = 4, the earth circles around the sun, and Shakespeare wrote Hamlet. She immediately objected and said "that's not truth, those are facts!" I answered, "Well, are those facts true or not? What makes the statement 2 + 2 = 4 a fact and 2 + 2 = 5 not a fact? Isn't it an idea known as truth?" As you can see, this girl was trying desperately to draw a line between matters of faith and things that fall in the category of math and science. She was trying to say that faith is merely a personal choice, like which ice cream flavor is best. But God either exists or He doesn't. Jesus of Nazareth either really lived, really was crucified, and really rose from the dead or He didn't. These statements aren't nearly the same as liking a particular ice cream. They are questions of history and of existence. That means they can be investigated and facts can be discovered. Reasons for their truth or falsehood can be offered. And if it's found that there are good reasons for believing in these claims, then we are only unreasonable if we refuse to believe them. So reason and faith are not opposites. The Christian faith rests upon the reasons we have for believing in things like the resurrection. In our Proverbs passage, God says that we are to cling to "the words of the wise"; we are to cling to "excellent things of counsels and knowledge." Wise words, counsels, and knowledge are all objective terms; words are only wise or knowledgeable if they are true. 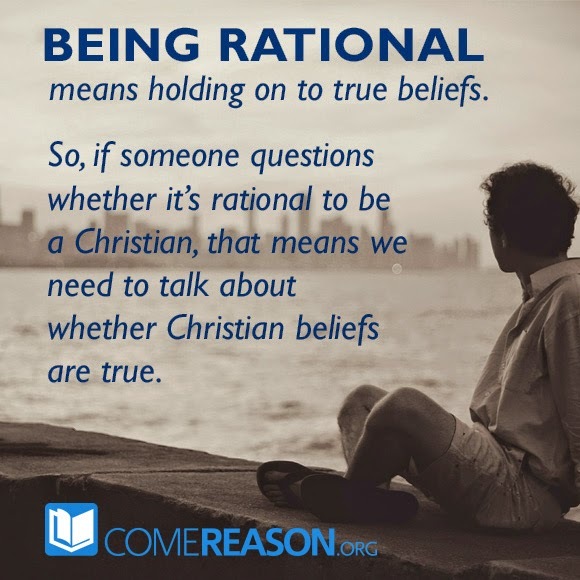 And if something is true, then it must be rational to hold to such as belief. That's why God says we can know the certainty of the word of truth. To do anything else would be irrational! 1. The most prolific of those that would contrast faith to reason are the so-called "New Atheists" such as Richard Dawkins, Sam Harris, and Christopher Hitchens. In his book The God Delusion, Dawkins writes that belief in God is "a persistently false belief held in the face of strong contradictory evidence"(p.28) which is tantamount to shutting your eyes and denying what's in front of you.